St. Luke’s Theatre educates and trains artists to be collaborative, to be innovative, and to be leaders. Our program is practical, artistic, and interdisciplinary. Students study dramatic literature in theory and historical context, and explore in a hands on manner. 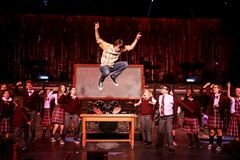 Students may experience classic, contemporary, and new work in dramatic and musical theatre arenas. Two plays in the fall and spring (Upper & Middle Schools). In winter 2019, there is a special All-School musical. Acting classes also perform at the end of each semester. Amelia Wyckoff '18 wins the Best Featured Actress in a Musical award as "Little Sally" in the winter 2018 production of Urinetown. The Seldin Performing Arts Center's 482 orchestra seats retract to reveal a 2,000 sq. ft sprung floor used for a variety of performing arts and education programs.